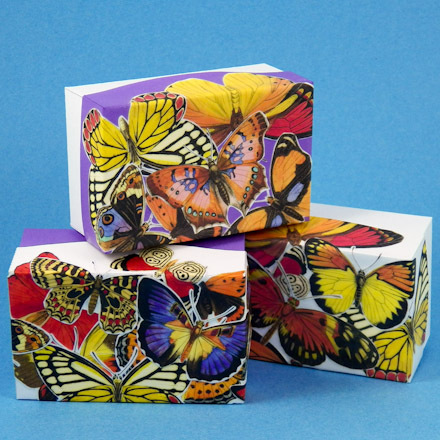 In this project, you will learn the basics of decoupage by decorating a box made from cardstock with images printed on your color printer. Decoupage originated in Victorian England as a way to decorate items in the style of Oriental enamels without all of the painstaking work. 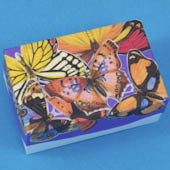 Decoupage basically involves applying paper cutouts to the surface of an item and then finishing the item with many (12 to 16) coats of varnish to get the look of enamel. In this simple project, you will apply paper cutouts to a cardboard box, and then apply three or more coats of an acrylic sealant like Elmer's Glue-All or Mod Podge. 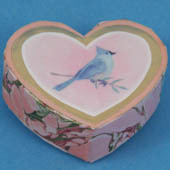 The same technique can be used to decoupage wooden boxes, glass vases or plates, etc. With the wealth of images available for downloading and printing, this traditional craft is well-suited to modern times. See the sidebar for more decoupage ideas. 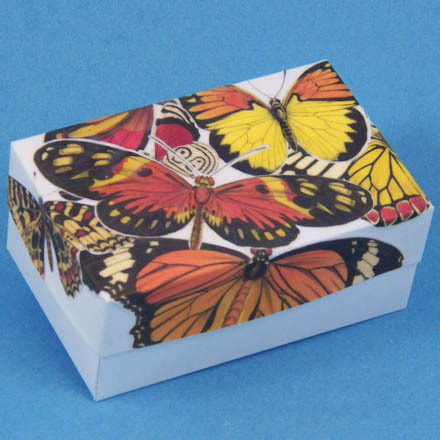 Make a box using white or colored cardstock following the instructions in one of Aunt Annie's Box projects. The samples shown in this project were made using the Plain deeper pattern in the Shirt Box project. Select and print images to cut out and apply to the box. The images can be from clip-art collections, downloaded from websites, or scanned from books or magazines. The images used in this project come from Dover's Decorative Butterfly Illustrations. Keep the size of the box in mind when selecting and printing the images. The rectangular box made from the Plain deeper pattern has a lid that is 2¼" by 3½", so print enough 1" to 3" images to cover the box's lid. 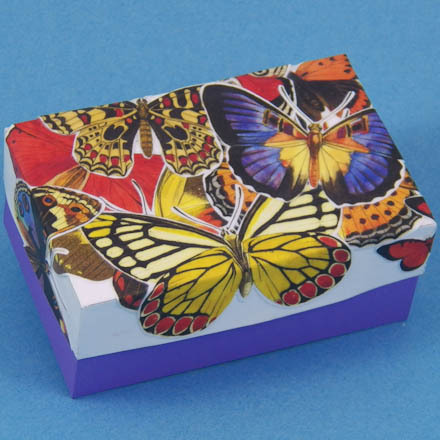 Instead of using images from clip-art or photos, cover your box with collage paper that you make yourself! It's simple if you have a scanner. Collect objects for your collage, like the fall leaves in this example. Arrange the objects on a sheet of paper, and when you are pleased with the arrangement, adhere them with double-sided tape or glue. Scan the paper to a jpeg image file with at least 300 dpi resolution. Correct the image contrast and colors, if needed, using photo software. Print the scanned image to paper. Follow the instructions in the Shirt Box project to make a box covered with paper. Give the box a decoupage look by sealing the paper and coating the box with sealant as described below. 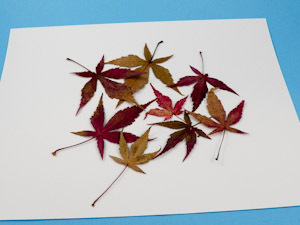 Use Aunt Annie's	Leaf Collage ePaper, if you like. 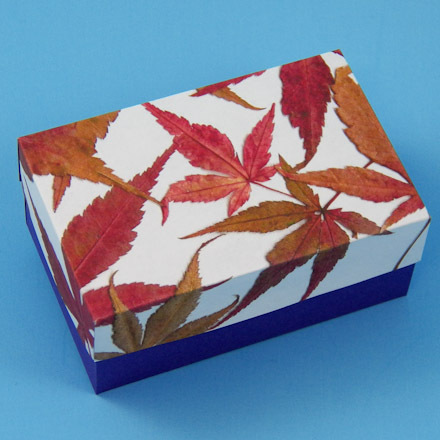 It's a collage of Japanese maple leaves in fall colors, and it will easily cover the lid of the box in the Plain deeper shirt box pattern. Seal the printed images with a light coating of white glue thinned with a little water. Allow images printed from an inkjet printer to dry completely before sealing. Mix the glue and water using a craft stick and apply the mixture to the images with a foam brush. Tip: This coating will make cutting the images easier, and will reduce the bleeding of inkjet inks. However, some brands and/or colors of inkjet inks bleed more easily than others. Experiment with images printed from your inkjet printer. Increasing drying time may reduce bleeding. After the sealant has dried, first cut the images apart into individual pieces. Then, using small sharp scissors, cut around the edge of each image, leaving an 1/8" or smaller margin of white paper. Tip: Use a craft knife for very intricate designs, or to cut out any interior spaces. Tip: For simpler cutting, use these Geometric Templates to cut the images in diamond, square, triangle, hexagon or circle shapes. You can tile the shapes on the box lid or overlap them in a pleasing arrangement. Experiment with various arrangements of the cutouts on the box lid. Use a repositionable glue to allow for easy placement and removal of the cutouts. You can arrange the cutouts in a pattern, or cover the surface completely, even overlapping the cutouts. Keep experimenting until you are pleased with the design. Glue the images in place using white glue diluted with a little water. 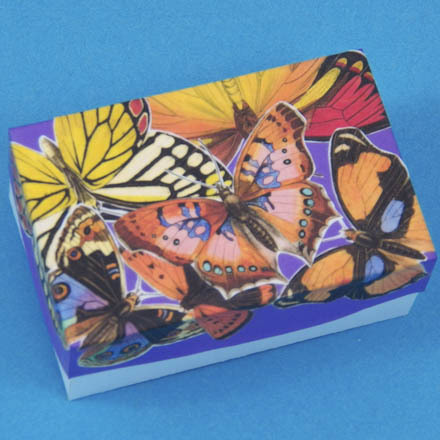 Press down on the images and rub over the surface with your fingers to ensure good adherence to the box lid. Let the glue dry completely before going on to the next step. Tip: Pay special attention to the edges of the cutouts. Be sure that they are firmly adhered. In a small plastic container with a lid, make a mixture of 3 parts white (PVA) glue to 1 part water. Mix with a craft stick. 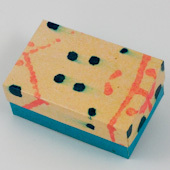 Using a foam brush, apply a light coating of the glue mixture to the box's lid, covering all the cutouts. The cutouts may pucker a bit from being wet. Don't worry—they should flatten out as the glue dries. After the first coat has dried completely, check for any edges that are loose and glue them down. Apply additional coats of the glue mixture until you achieve the look you want. Usually, 3 to 6 coats will be enough. Be sure that each coat dries completely before applying the next coat. Tip: For a glossy finish, spray the finished piece with a clear acrylic sealant. That's it! Your box is done! 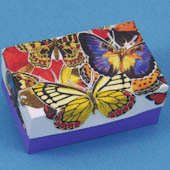 Decoupage Idea: Shaped and layered cutouts are an elegant way to decoupage a box lid. Like seen on this Heart-Shaped Box. Decoupage Idea: Patterned tissue paper can be decoupaged onto a box lid. It's easy to add a design to plain tissue paper with Tissue Paper Painting. Tip: The cutouts can be glued in overlapping layers in order to nearly or completely cover the surface of the box lid. 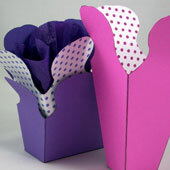 Tip: For a look with more depth, make the box lid with colored cardstock that contrasts with the paper cutouts. Leave uncovered patches so that the color of the box's lid shows. 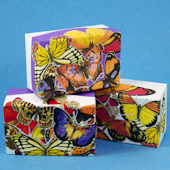 Related project: Decorate any of the boxes from Aunt Annie's box projects with decoupage. These Flared Boxes are well-suited for decoupage. Tip: For an interesting look, apply images that extend beyond the edge of the lid, then trim them flush to the edge.